2 Tabelas anteriores ao começo do programa Top Disco publicadas no Diário de Lisboa. O início do programa "Top Disco", com as primeiras tabelas oficiais em Portugal, esteve previsto para Abril de 1984 mas apenas começou em 6 de Outubro de 1984. O programa começou por ser transmitido aos Sábados pelas 19h00. 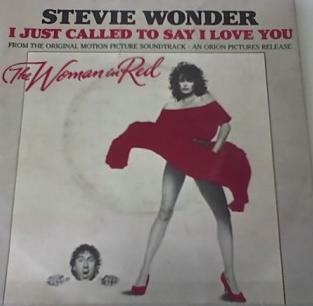 Na primeira semana estavam em primeiro lugar o single "I Just Called To Say Y Love You" de Stevie Wonder e o álbum "Born In The USA" de Bruce Springesteen. 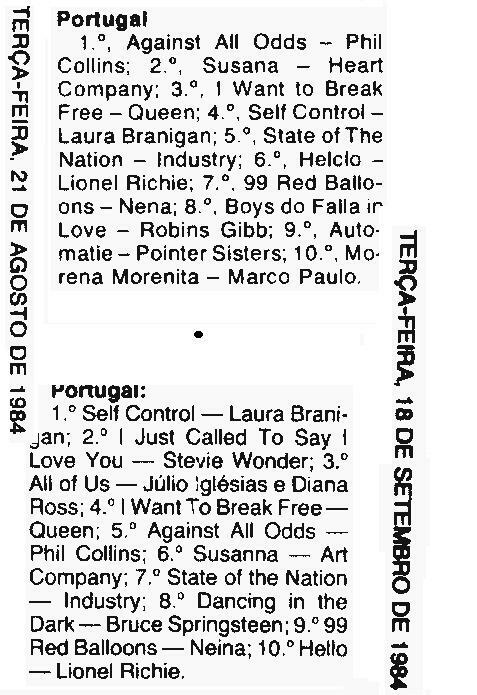 O single de Stevie Wonder dominou as tabelas durante os últimos meses de 1984 e os primeiros de 1985. A revista Música & Som continuou a divulgar a tabela por si elaborada. Não constam as vendas da Rádio Triunfo que foi excluída de sócia do GPPFV por não fornecer os dados de 1984. Transmédia: Júlio Pereira (Cadói) . Há sempre lugar para alguns artistas da música. Neste caso o cromo de Stevie Wonder com "I Just Called To Say I Love You". You listed Queen's "I Want To Break Free" twice. Where did you find out it was #1 in 1984? Is that confirmed? Also, Queen's "The Works" was certified gold in 1984 and was one of the very best selling albums of the year. Could you please list the peak positions for other Queen albums like "Innuendo", "Greatest Hits II" or "Five Live"? I heard some of them were #1 but I haven't been able to confirm them. I could confirm #1s for "I", "MIH" and "GHII", #2 for "Live Magic" and #3 for "AKOM". I have few information in some years so i can't help you in other records. Most of the information is already in the blog. "Five Live" was considered as a longplay and reach the charts but I don't have that information. 1984 was the year when began the official charts with the tv-show "Top Disco" (Oct 1984). 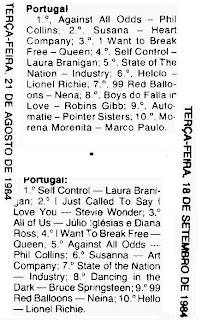 "TW" and "IWTBF" were nº 1 on the same week as the nacional chart (July 1984) of "Música & Som" that I found in the internet. "Platina" only after 1982/3. I don't have other figures. Thank you for this amazing information. It is good to confirm this: so Queen had at least 4 number one albums. Firstly, You mentioned that "Live Magic" was #2 in 1987. Do you know wich album was charting at #1 during that same week where Queen's "Live Magic" reached #2? I'm asking you for this because if it was outsold by a Various Artists album, I would count the Queen album as a #1 record. Secondly, I think that "Live At Wembley '86" was also #1 in 1992. It was among the very bst selling albums of the year. Any idea? And to end, do you know other peak positions for any Queen or Freddie Mercury related singles? A Portuguese friend told me that "Crazy Little Thing Called Love", "Body Language", "Innuendo" and "Bohemian Rhapsody" were chart toppers in Portugal. Sorry if I'm asking for too much. you may know some these things. I'm a big Queen fan. I have all their certifications, are you interested? I posted all the information I found here on UKmix. "Em 1993 é editado "The Freddie Mercury Album", chegou ao primeiro lugar nos Tops de vários países, Portugal incluído. "Living on my own" arrasou as discotecas do mundo inteiro." If you are able to confirm it, it would be great. I realize you don't have all the information you would like to have; however, if you ever come cross this, just post it, please. I love Portuguese charts. This is an incredible blog. No reply to my questions? Please, you can help me. "Em 1993 é editado "the Freddie Mercury album", chegou ao primeiro lugar nos Tops de vários países, Portugal incluído. "Livin´ on my own" arrasou as discotecas do mundo inteiro"
Why did you delete my last message? If I broke any rule, just let me know. I just want to collaborate as much as possible and know certain things about Queen, because I'm a big fan. No message was deleted! There must be a problem with the comments box. But in same cases it's better if you put your questions in the years of the records. Someone could help you in the future. No data for other records. It was a problem with the spam detection. You could put suggestions or information of any records (or artists) in the years related. Sometimes you put Telepac as a source. What type of information is that and where you found it? The Billboard issue that refers Queen as best sellers on 1984 mention other records or artists? Now I see. I was assuming you had deleted them but I was wrong. I didn't mean to sound rude, I was just curious to know what had happened. Sorry for that. I doubt they will reply. I think Telepac.pt may be an old site or something. The people behind this information are those who work for AFP. Note how they coincide with the annual articles. In 1992, "Greatest Hits II" was certified quadruple platinum, which is what you listed in the blog. This proves this is right. 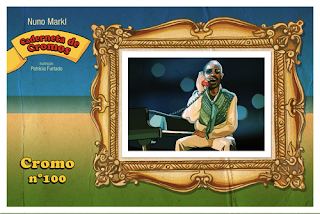 "News Of The World" (2 weeks) and "Jazz" (1 week) were #1 on "Musica & Som" charts. I can guarantee you also that the single "Innuendo" was #1 in 1991. Thank you. I'm glad to know both albums were number one in Portugal, plus, it is great to learn that "Innuendo" reached the top position on the singles chart. Please, if you find the peak positions for "A Day At The Races" (in 1977), "Live Killers" (in 1979), "The Game" (in 1980), "Greatest Hits" and "Hot Space" (in 1982), share them with me. I know you aren't collection Queen related information like me; but, if by any coincidence you do find out what peak positions those albums achieved, it would be great if you could share that with me. When you mentioned that both "News Of The World" and "Jazz" were number one in Portugal, did you take it from the actual magazine "Musica & Som" which you found yourself? Or did you take that from queen.home.sapo? Personally, I don't trust that site even if some peaks are right, of course. I would like all that to be confirmed. For example, do you believe "Live At Wembley '86" was #1 in 1992? You didn't list it as an "album em destaque" for 1992. The same for "Greatest Hits" in 1982: is it possible for it to have been #1? I hope you do find that out, eventually. About "Live At Wembley '86", I now remember that it was double platinum in 1992 (40,000 copies, because it is a double album) and it finished the year end chart at #6 in 1992. But there has to be a reason why you didn't list an "album em destaque". Or maybe you just didn't find any chart for that specific period? It was released in May and will have started charting in June 1992. In some years (like 1992) we don't had access to all week charts (the Freddie Mercury's records are another example of that) but as you mention "Live At Wembley" was one of the best sellers in that year. The information of #1s was found in an article of Musica & Som. I trust the site http://queen.home.sapo.pt because it seems correct with the data we have. I hope you can eventually find all that. But it is already great what you have found. Thank you for sharing it. Just curious: do you know how many weeks "Innuendo" and "Greatest Hits II" spent at #1 in Portugal? So "The Works" was the #2 album of 1984, plus Queen had two singles in the annual Top 10. Very successful year for the bands. I'm not surprised that "Thriller" was the best selling album of 1984.